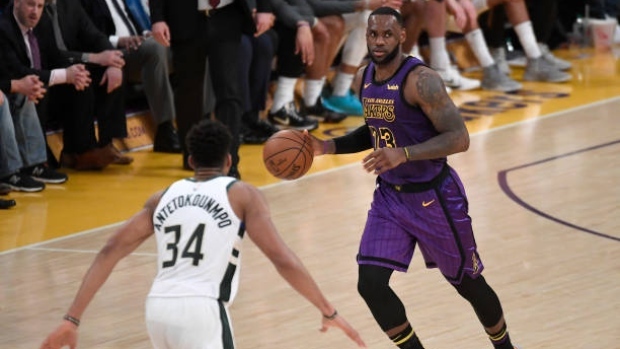 Stars LeBron James of the Los Angeles Lakers and Giannis Antetokounmpo of the Milwaukee Bucks will both be out when the two teams play Tuesday night in Milwaukee. James is being rested because of a sore groin, and Antetokounmpo has a right ankle sprain. LeBron James is out tonight with a sore left groin per the Lakers. Giannis Antetokounmpo is out tonight against the Lakers. For James, this will be the third game he has missed since returning from a groin injury that kept him out of 17 games from late December through January. The 33-year-old did not play on March 15 against the Detroit Pistons, the second game in a back-to-back. In James' last appearance, Sunday's 124-123 loss to the New York Knicks, he played 35 minutes and scored 33 points. He has averaged 36.1 minutes a night in the 17 games since his return. Antetokounmpo, on the other hand has enjoyed good health this season, appearing in 65 of the Bucks 70 games thus. The 24-year-old is largely the reason the Bucks currently have the best record in the NBA at 52-18. Milwaukee's record, plus the 27.5 points per game and 4.4 rebounds Antetokounmpo is averaging this season, is why many consider the 24-year-old a strong contender to win this season’s MVP award.